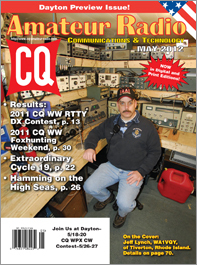 CQ's "Washington Readout" editor Fred Maia, W5YI, a leading amateur radio journalist and a pioneer of volunteer examining, passed away on March 28 following a battle with cancer, after this issue went to press. He was 76. See complete obituary on the CQ News page at <http://bit.ly/H3tpyJ>. 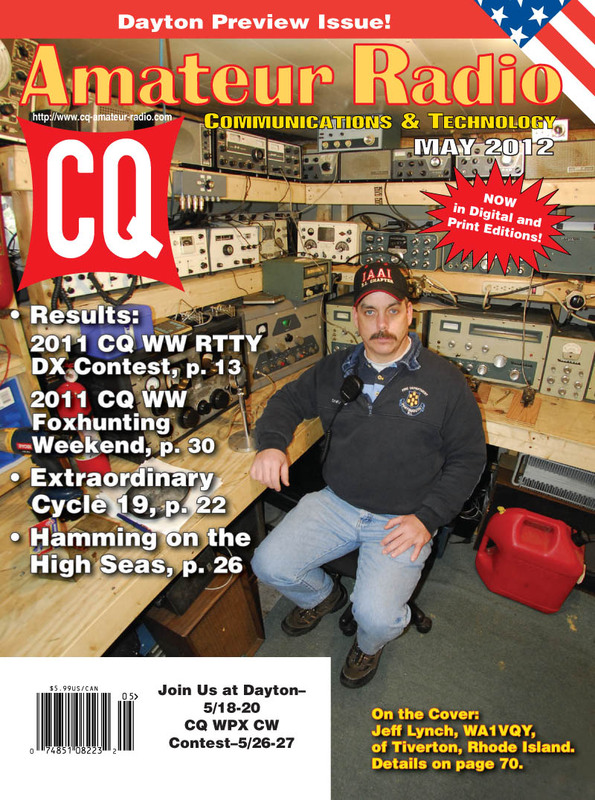 The May issue of CQ is our Dayton preview issue, featuring columns and ads highlighting new products slated to be introduced at this year's Hamvention®. We start out the issue with the results of last year’s CW World Wide RTTY DX Contest – the 25th running of the world's largest radioteletype competition. It was yet another record-breaking year for the event, as logs submitted rose 25% over 2010 and the number of callsigns recorded in those logs was up by 18%. In addition there were seven new world records set (on top of 12 last year) and 47 new continental records! World top scores include LY5E, VA2UP, KI1G, VP9I, EF8M, P49X and CR3L. The Bavarian Contest Club once again took the club competition. With solar Cycle 24 finally showing life, frequent CQ contributor Ed Richmond, W4YO, reaches back to bring us his recollections of the "granddaddy" of all sunspot cycles, "The Extraordinary Solar Cycle 19" in the late 1950s and early 1960s. To get us ready for June's "Take it to the Field" special, Robert Hayos, K6CUK, takes it to the waves in "Hamming on the High Seas," an article about operating maritime mobile on cruise ships. The May issue also includes the results of last year’s CQ World Wide Foxhunting Weekend and the rules for this year’s running of the event, scheduled for May 12-13 (but clubs may choose any spring weekend for their entries). In this month's columns, “Math’s Notes” editor Irwin Math, WA2NDM, looks at a wideband field strength meter, "Washington Readout" editor Fred Maia, W5YI (SK), provides details in his final column on the International Telecommunication Union's decision to create a new ham band at 470 kHz -- the first amateur allocation above 600 meters since the beginning of radio regulation a century ago! 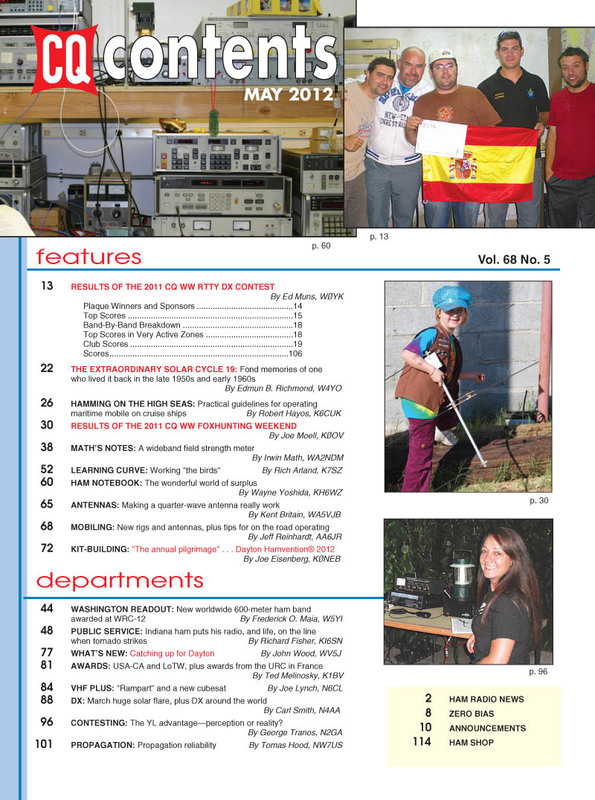 We also look at the ARRL's guide to keeping legal with our new privileges on 60 meters (5 MHz). Please click here for an update on digital modes released after our May issue went to press. Public Service Editor Richard Fisher, KI6SN, profiles an Indiana ham who risked his own life to help others escape from a tornado; "Learning Curve" editor Rich Arland, K7SZ, shows us how easy it is to get started in working amateur radio satellites, and "Ham Notebook" editor Wayne Yoshida, KH6WZ, takes us on a tour of "The Wonderful World of Surplus." Antennas Editor Kent Britain, WA5VJB, says "a quarter-wave antenna is a horrible, virtually non-functioning antenna," and then spends the rest of his column explaining to how to make a 1/4-wave antenna "really work." Mobiling Editor Jeff Reinhardt, AA6JR, covers "New Rigs and Antennas, plus Tips for On-the-Road Operating;" Kit-Building Editor Joe Eisenberg, K0NEB, previews "The Annual Pilgrimage" to the Dayton Hamvention®; and New Products Editor John Wood, WV5J, catches up on pre-Dayton product announcements to clear the decks for all the new stuff we'll be seeing over the next few months. Awards Editor Ted Melinosky, K1BV, discusses the USA-CA Award and Logbook of the World (not yet…), plus awards from France; “VHF Plus” editor Joe Lynch, N6CL, looks at the "Rampart" cubesat and its mission; DX Editor Carl Smith, N4AA, writes about the monster solar flare that affected DX propagation in March, as well DX news from around the world, and Contesting Editor George Tranos, N2GA, asks if the supposed "YL Advantage" is reality or merely perception. Finally, Propagation Editor Tomas Hood, NW7US, looks at "reliability" in propagation forecasts and what the term really means in this usage. That's a brief look at what's coming up in the May issue of CQ magazine, which should be on newsstands and in subscribers' mailboxes by end of April and available online as of May 1. For information on becoming a CQ print or digital subscriber, Click Here!